Despite your busy lifestyle, it’s crucial to maintain a proper diet. The next time you crave something quick, easy and nutritious, try this smoothie. The grind of a long spring season is in full swing. Hours spent afield, early mornings and even later evenings wreak havoc on the body and mind. You’re hunting hard, working, spending time with the family and still trying to keep a handle on your workout routine. It’s exhausting. During this time, if we’re not careful, we will run our bodies right into the ground. Sickness and physical injury will result. Blend all of the ingredients above to desired consistency. That’s it! Bottoms up, and enjoy. RELATED: How About Fasted Cardio for Weight Loss? Not only does this smoothie taste like an amazing desert, but it’s loaded with nutrients. I’ve found the MTN OPS Ignite (Green Apple flavor … yum!) provides me with sustained energy without the crash. When mixed with a couple of BCAA capsules, it really helps with post-hunt and post-workout recovery. The MTN OPS Whey provides 23 grams of protein, 1.5 grams of L-Glutamine and 5 grams of BCAA. It is also loaded with essential and non-essential amino acids. In less than 5 minutes, you can prepare a healthy shake containing 765 calories and 45 grams of protein. Oh, and did I mention it tastes like a desert? I’m addicted to these things. Plus, you can change it up by using different fruit and yogurt flavors. 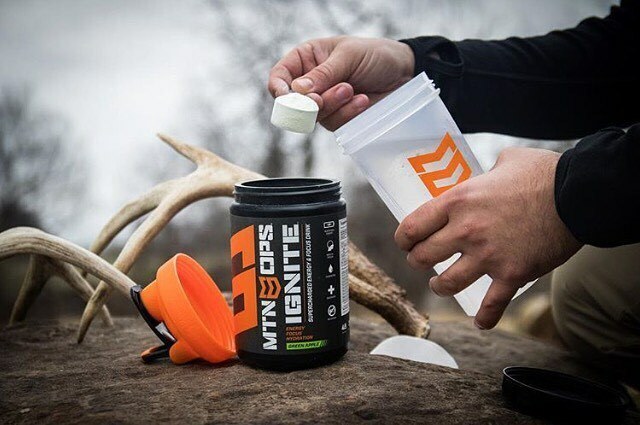 I have at least two shakes per day, but only use the MTN OPS Ignite in one of them. Enjoy!